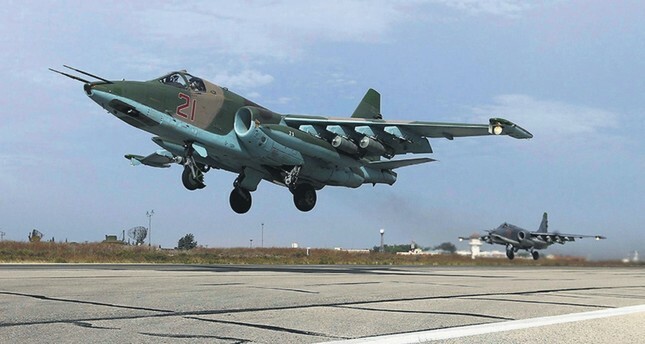 Su-25 fighter jets take off from the Hmeymim Air Base near Latakia, Syria. It has become apparent that opposition factions in Syria are in a rift again, particularly in Idlib, which has become a "clash zone" for various actors seeking to impose their influence on the region. The regime and Russia decreased their attacks after the Astana talks and seem to be worried about the Democratic Union Party's (PYD) expansion. A quick look at previous years will show that the regime has pounded PYD positions in Hasaka as a way of showing its discontent with the idea of autonomy. Besides, Russia has staunchly opposed such a move and has declared its support for Syrian unity. Yet, the intra-opposition fight and the recent Qatari crisis, which has crystallized disputes among certain countries, and which were on the same side in Syria, whet the U.S.-backed PYD's appetite for Idlib and for reaching the Mediterranean, thereby spanning the whole Turkish border. Keeping in mind that Russia deployed soldiers in Afrin after Turkey drove Daesh out from its borders and warned the PYD not cross the Euphrates' west, a title of an article in Sputnik, the mouthpiece of the Russian government, likened Syrian Democratic Forces (SDF) to other "terror" groups. Thanks to the comments of a political analyst, Sputnik's choice for the title may be seen as a signal, revealing Russia's changing stance toward the PYD and the so-called SDF, which symbolically contains some Arab fighters as well. The silence of Russia and the targeting of pro-regime militias by the U.S. have raised the question of whether Ankara and Moscow entered into an alliance, particularly in Idlib. In this scenario, the extremist elements can be curbed by Turkish-backed groups so that Russia obtains the opportunity to focus on the anti-Daesh fight in Syria's east. Hence, the PYD will not emerge as a victorious group against the most brutal terror group. Yet, it may not be as simple as it seems, since the crisis in Syria is multi-dimensional and not independent from other regional developments. Dimitar Bechev, who teaches at Sofia University in Bulgaria and focuses on Turkish-Russian relations, said Russia is considering the PYD's moves cautiously. He said the PYD's attempt to create a corridor is very risky and may antagonize many actors. Ömer Aslan, who is an associate fellow at Al Sharq Forum and an assistant professor at the Institute for Security Sciences at the Turkish National Police Academy, said the PYD was trying to have two patrons at the same time, namely both the U.S. and Russia. "The PYD is signaling to the Russians that they are ready to be trained by them to directly or indirectly helpi Russia target al-Nusra Front in Idlib, all the while telling the U.S. that they can happily continue targeting Daesh in Raqqa. Both the U.S. and Russia are perfectly aware of how needy the PYD is. The PYD constantly needs to appeal to both Russia and the U.S. to realize their plans," he said. Bechev added that the PYD would not become a matter of dispute between the U.S. and Russia, as Moscow is happy with the group's neutral stance toward the regime. "The PYD has to be aware of America's future intentions - a possible abandonment. In the meantime, it cannot estrange Russia either," Aslan added. In response to the question of whether the "de-escalation zones" agreement hint at a local Turkish-Russian alliance against the PYD, Bechev clearly said he disagreed with this argument, but added that Russia will seek to restrain the PYD without picking a side in its conflict with Turkey. Aslan also said that more time was needed to see how things play out, but that Russia had the upper hand. Saying "the Russian presence in Afrin, in and of itself, is not a meaningful indicator of Russia inching closer to Turkey's interests in Syria," suggesting that Russia would continue to conduct the PYD. While the PYD appears to be a very useful group in the fight against Daesh, its ambitions for autonomy may trigger Russia's anger as well, since Moscow has repeatedly declared its intention to keep Syria unified. Besides, it is uncertain how the two international actors will treat the PYD once Daesh is eliminated.